PRODUCT DESCRIPTION STAND NOT INCLUDED. Natural gas: 4.0, LPG: 11.0. Tube Fired located inside frypot. Heavy gauge metal, built-in deflector system. 14" x 12-1/2" (356 x 318 mm). Cool zone area below tubes. Snap acting, 200° F - 400° F (93° C - 204° C). Recessed, 1-1/4 (32 mm) full port. 6-1/4" x 12" x 5-1/4 (159 x 305 x 133 mm). Stainless steel exterior, except back. 15-1/2" w x 29-1/4" d x 24-1/2 h (394 x 743 x 622 mm). 4 (102 mm) Stainless steel. 16-1/2" w x 31-1/4" d x 24 h (419 x 794 x 610 mm) (457 x 787 x 483 mm). There will be an additional charge for the following. There are NO ADDITIONAL charges if you are picking the item up from our warehouse location and we are glad to help you load the item. Please bring rope or tie downs to fasten the item securely, we DO NOT supply any. Mike's Restaurant Equipment & Supply. 1637 N O'Donnell Way. Thanks For Visiting and we look forward to hearing from you soon. 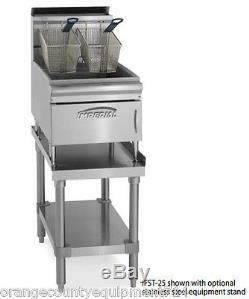 The item "NEW 25 LB Gas Deep Fryer Counter Top Stainless Steel Imperial IFST-25 #4571 NSF" is in sale since Tuesday, February 21, 2017. This item is in the category "Business & Industrial\Restaurant & Food Service\Commercial Kitchen Equipment\Cooking & Warming Equipment\Fryers". The seller is "orangecountyequipment714" and is located in Orange, California. This item can be shipped to United States.